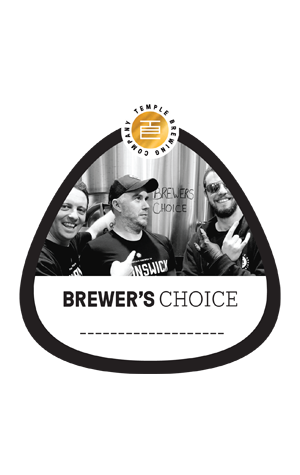 Temple Brewing head brewer Glenn Harrison's parting gift to the Brunswick East operation before moving on is the fourth beer in the Brewer's Choice series he launched earlier in the year – one-off, draught only beers conceived by and ordered direct from the brewing team. You might expect a brewer to sign off with something extravagant – loaded to the eyeballs and beyond with hops, aged in barrels or showcasing some unusual ingredients – but that's never been Glenn's way; sure, he's won an AIBA trophy for his Anytime Pale Ale and a gold for an imperial stout in the past but he's also told us at various times he'd quite like to have a brewery producing solely dark beers or spend his time trying to perfect a pilsner. So, what you have here is a lager, albeit one with a couple of twists. It features rye malt and two fruity members of the new wave of German hops, Arianna and Callista. And it's described as a "traditional tasting lager with soft esters and a clean, spicy rye finish [that] blends superbly with the new noble hops offering aroma and flavours of citrus, blackberry and grapefruit." Get your hands on it straight from the horse's mouth.